PAGASA forecast as of 5 p.m. Saturday, July 26, 2014: Southwest Monsoon is affecting western Luzon. More weather update after the jump. The state weather bureau reports that a low pressure area (LPA) was spotted at 700 kilometers East of Northern Mindanao. 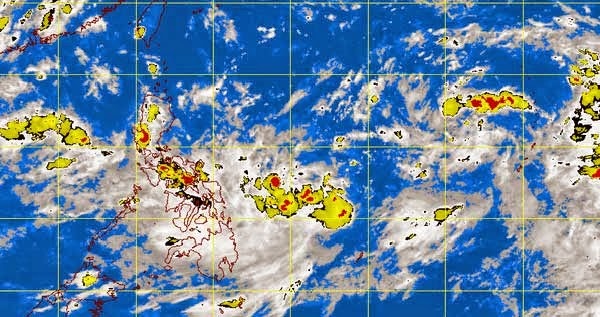 Forecasters said the provinces of Zambales and Bataan will experience occasional rains while Visayas, Bicol Region, Northern Mindanao, Caraga and Davao Region will be cloudy with light to moderate rainshowers and thunderstorms. On the other hand, Metro Manila and the rest of the country will have partly cloudy to cloudy skies with isolated rainshowers or thunderstorms. Moderate to strong winds blowing from the southwest to west will prevail over Visayas and Northern Mindanao and the coastal waters along these areas will be moderate to rough, the weather agency reported. Elsewhere, winds will be light to moderate coming from the southwest over the rest of the country with slight to moderate seas, according to the PAGASA forecast.